Have you ever been on a travel tour that allows you to go to the market, buy fresh food and make your own dish of the traditional cuisine of that country? This half-day cooking class tour with Vietnam Travel Group is the exact chance for you. 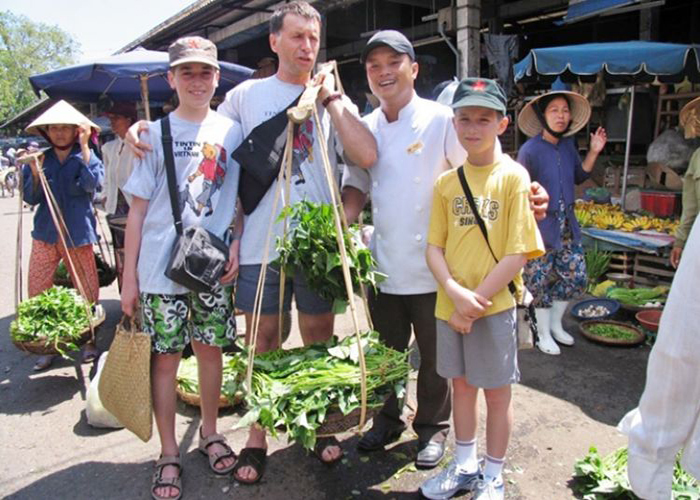 Why should you join Ho Chi Minh City cooking tour? There is an ancient saying that I’m sure all of you have heard of, it’s “the way to a man's heart is through his stomach”. Food plays an important role in our life just like that. It doesn’t just keep us alive every day, but also a great method to express a country’s culture and customs as well. Therefore, when traveling to a place, people usually excited to learn about its cuisine and traditional dishes. Vietnam is famous for its delicious food, which has been recognized by many famous chefs in the world (such as Gordon Ramsay). 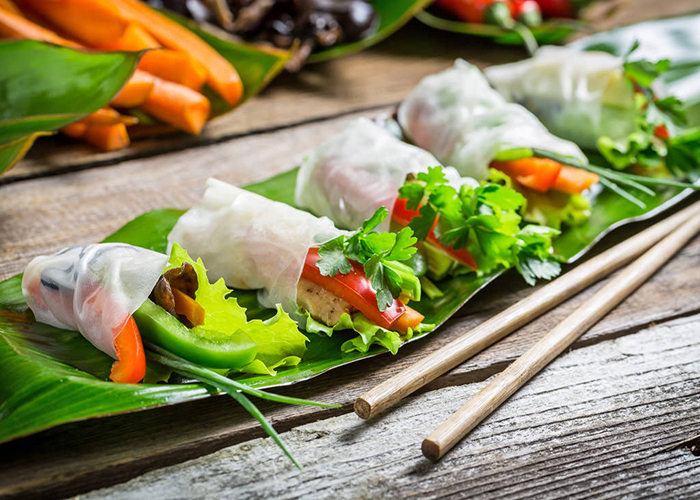 Joining Vietnam Travel Group’s cooking tour, you will have the perfect chance to truly explore the tasty cuisine of Vietnam, instead of just buying and eating like you usually do. The tour only lasts for half a day, so it’s has a reasonable price which is very suitable for your budget and schedule. Don’t be hesitate to go on an interesting cuisine trip with us now! How is this cooking trip organized? First off, our tour guide from Vietnam Travel Group will pick you up from the hotel. Then, they give you a brief introduction about your schedule for the day. Then you will be taken to Ben Thanh market to shop for the fresh food you needs. After that, you stop by Mai's Home Culinary Center to learn about Vietnamese food as well as try to cook the dish deliciously. The short but wonderful experience will leave such sweet memories in your mind. Where will you buy Vietnamese food? As mentioned above, your destination to buy tasty fresh ingredients is Ben Thanh market – the biggest market in Ho Chi Minh City. Ben Thanh Market is a market located in District 1 of Ho Chi Minh City. It lies in Cua Nam - the intersection between Phan Boi Chau, Phan Chu Trinh, Le Thanh Ton streets and Quach Thi Trang site, Ben Nghe ward and also known as the oldest market here. The market was constructed from 1912, and completed at the end of March 1914. In many cases, the image of the clock in the south gate of this market is considered an unofficial symbol of Ho Chi Minh City. 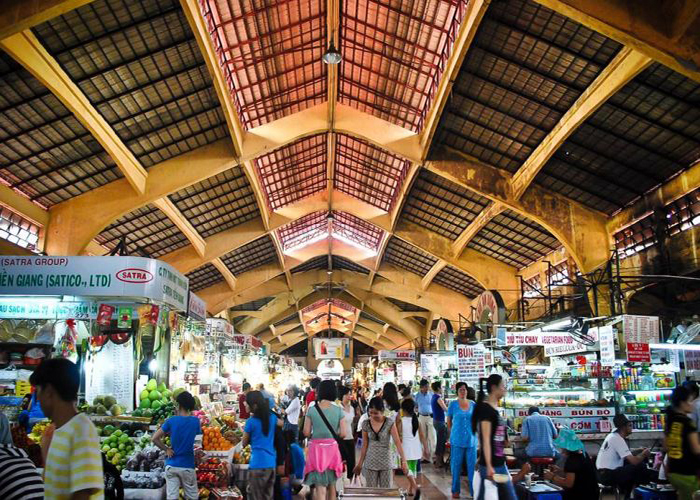 The market has a history dating back to the beginning of the 17th century, at which time the market was located near the Saigon River and it was a place of trading for small businesses. By the time of the anti-French resistance war, the market was located on the bank of Ben Nghe river, which was used to serve visitors and soldiers who went into the place. So, the market is called Ben Thanh Market. With an area of over 13000 meters square, the market sells various items such as clothes, fabrics, shoes, fashion, handicrafts, fresh food, fresh fruits and flowers. In addition, the market is very rich with snack shops, dishes of different regions in the South. There is no better place to learn about the traditional cuisine of Vietnam than Ben Thanh market. Coming to the market, our tour guide will introduce to you everything you need to know about fresh ingredients in Vietnam. They will also help you with choosing the best-quality food so your dish can be as delicious as it could be. This bustling and crowded market is a familiar place for Vietnamese people to stop by, buy products, eating tasty street food and catching up with each other’s story. Coming to Ben Thanh market, you will also have a clear look of what life in Vietnam is like. The best part of our Ho Chi Minh City cooking tour is after the Ben Thanh market, you will start cooking for real. To learn about Vietnamese dishes, you will be taken to Mai’s Home Culinary Center, where there are enough tools and gadgets for you to start cooking. 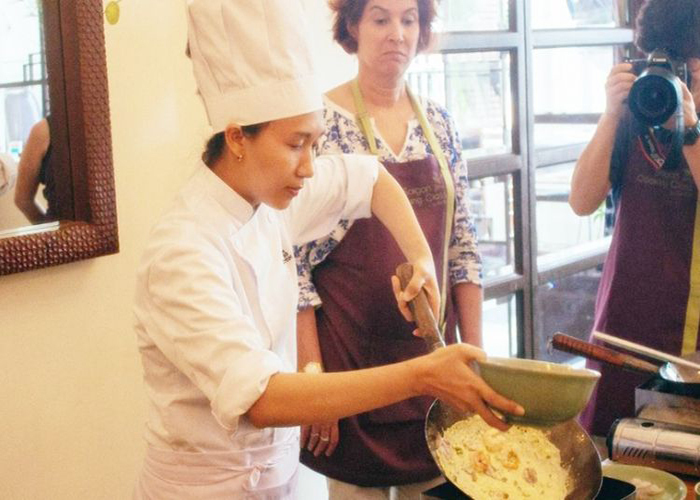 This is a famous destination for cooking classes in Ho Chi Minh City, where people can learn so much interesting information about Vietnamese food and recipe. Before starting, you will get a brief introduction about Vietnamese food in every place, the differences between food in the South and food in the Northern area of the S-shaped country. Food is different everywhere, even in one country. So it’s important to know about them before you start making anything. After you’ve known everything, you will begin cooking. The chef will teach you the recipe as well as each step to make a perfect dish. It’s interesting to experience cooking a Vietnamese dish on your own instead of buying it from the restaurant. That way, you can learn a lot of wonderful facts about Vietnamese cuisine. The experience will be one-of-a-kind and leave you amazing memories. After you’re done, you can sit down and enjoy the products you just made with your loved ones. The best food is always the one you make yourself, right? And then that’s the end of your exciting day with the delicious food of Vietnam. The tour guide from Vietnam Travel Group will take you back to your hotel. When you go home, don’t forget to share this amazing experience with your friends too. 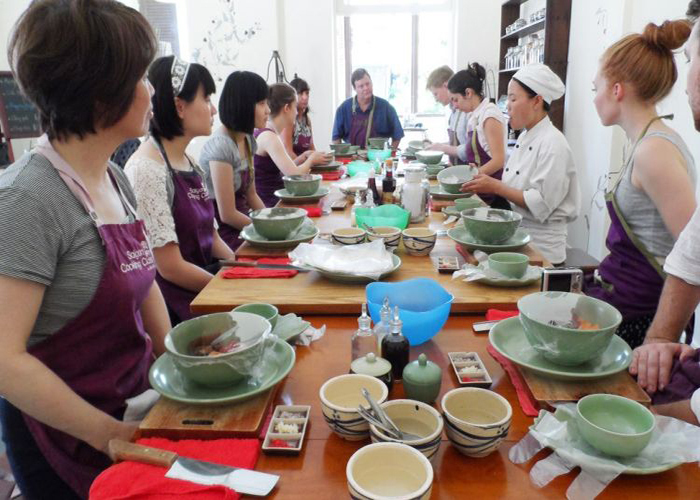 Book Ho Chi Minh City cooking class tour right now! Excited for a chance to truly research about Vietnamese cuisine? Don’t hesitate to book our half a day cooking class tour right now! If you have any questions, just contact Vietnam Travel Group and our staff will happily give you every piece of information you need. Besides this outstanding cooking tour, you can also visit vietnamtravelgroup.com for more wonderful travel tours in Vietnam too! Vietnam Travel Group is looking forward to having you in our beautiful Vietnam. Are you ready to explore with us?